Found my Topshop sequin blazer I got two years ago, I think I've worn it once before so I decided it was time to wear it again. I love sequin anything, same with leopard print. Pretty bad photos again I must admit, they weren't intentionally taken though we had to take some photos for where we are recording a piece for TV class. Here are some of my many Wednesday Wants. Particularly wanting the bright pink Zara dress, I so nearly bought it today. Well, there's always tomorrow! 23 comments on "Wednesday Wants"
I love your trousers! such a good colour. And i love all the wishlist pieces especially the light pink dress from topshop it's stunning with the gold detail! aww great I want ur blazer! I love your trousers. i can never find chinos that suit me, where did you get yours from? 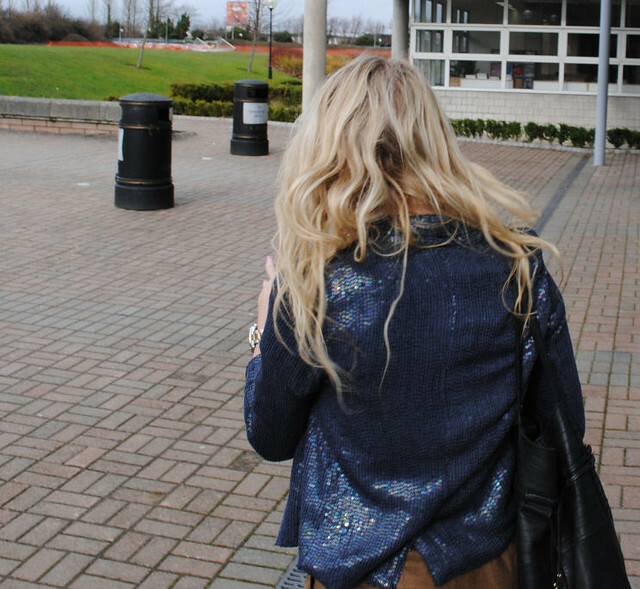 I love your blazer, sequins are so fabulous! And I want those platforms sososo bad. you should definitely wear that blazer more often - it's lovely! Love the blazer so sparkly and pretty! The collage is lovely and your blazer looks great! Lovely outfit, that blazer looks gorgeous! this is lovely, i love your pants. and i really want that pink lace dress.